As a lender, you need to demonstrate to your bank and to regulators that your company is compliant with Fair Lending regulations. Developing a compliance management system is the safest way to stay out of the crosshairs. Protect your reputation. Automate manual Processes. All so you remain audit-ready to regulators, your bank’s compliance team, and your internal stakeholders. Compligo consolidates your assigned fair lending policies, online training, and forms activities into a single view. And our experienced implementation team helps make sure your compliance program has the right content. Compli’s policies and training are developed and continuously updated by Hudson Cook, an industry leader in consumer financial services law, to ensure you stay on top of the latest regulations. Think of your Home tab as your compliance control panel. Here you can quickly access assigned activities in your Inbox, as well as your Started, Sent, and Completed items. Start your compliance activities in the Inbox. This is where you will find your set of assigned consumer finance compliance activities, including policies for Fair Credit Reporting, Gramm-Leach-Bliley Red Flags Rule, Telephone Consumer Protection Act, and more. After each employee reviews and signs-off on policies and completes online training, their compliance score and personnel file are both updated. Part of an effective compliance management system includes policies and procedures for the responsive and responsible handling of consumer complaints and inquiries. Compligo supports the procedures and policies to manage consumer complaints. The platform helps you organize, and retain the resulting findings so you can analyze results and make required changes in products, procedures, and/or training. Consumers (directly or via CFPB) submit complaints via online form, email, phone, mail or face-to-face. Compligo categorizes complaints by type and severity and get routed or escalated as needed. Team members review complaints and take action. Your compliance team analyzes the complaints to identify issues and trends that may require changes in products, procedures, and/or training. Regulatory bodies recommend you have comprehensive reporting capabilities to produce documentation necessary for an audit. In Compligo, every activity is time-stamped and easily reportable. With this insight you are able to uncover deficiencies, and remediate problems giving you an ongoing feedback loop to help you improve your processes and procedures. Get a visual, up-to-the-minute view of your entire organization’s compliance status. Export your compliance data for use in other reporting tools. As a manager, you can view the compliance score of each of your direct reports. And you can track compliance of your team against individual initiatives. For planned audits or unexpected examinations, export your compliance data for use in other reporting tools. Check the compliance status of yourself and your team at any time. Underwriters and loan officers need to be accountable for understanding policies covering unfair, deceptive, abusive acts and practices. To address this requirement with Compligo, the compliance manager creates a group in the system that includes employees with underwriter and loan officer roles. She then assigns UDAAP policies and training to this group and schedules the distribution. As the underwriters and loan officers receive notification of pending activities, they log in to Compligo, read and sign off on the policies and complete assigned training. The compliance manager tracks their progress and follows up on any incomplete activities. The process repeats automatically for any new employees hired into those roles. Alerts are set to ensure responses are sent in a timely manner in keeping with CFPB regulation. 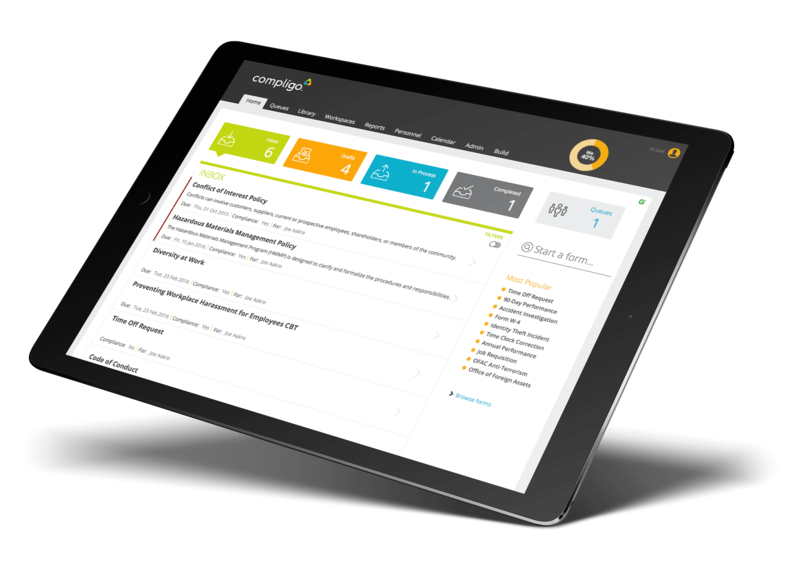 Unlike an LMS or a policy management application, Compligo lets you take a proactive approach to managing compliance. You define what activity needs to happen, who is required to complete it, and when it needs to happen. Compli offers a turnkey Compliance Management Solution for small lenders that provides the backbone for your Compliance Management System. Special pricing available for lenders with fewer than 30 employees. Compli is a great platform that integrates every part of the business, from compliance to operations to HR. In-House Counsel & Compliance Officer / Sierra Credit Corp.
Compli offers a great, purpose-built platform that assigns, tracks and monitors any workforce compliance activity – not just training. The platform can help any organization rein in its compliance processes and execute them more efficiently, consistently, and effectively. Compliance has never been optional, but there are a lot of companies in the past who have operated that way. In light of recent events, compliance has really stepped up in the last few years, so we really have to make sure all of our bases are covered and make sure we're always in compliance at all times. The training was pretty flawless. You know, I've dealt with a lot of different third party vendors as far as software, and they're usually not very fun to deal with. Compli was very, very good. I was honestly shocked about how easy it was. I just answered a few questions, and everybody over at Compli just kind of took it from there. All my employees know what the rules are and they know where the boundaries are, and they know not to step out of bounds. So my capital source feels much more comfortable knowing that my employees know where out of bounds is. All policies, procedures, training material, and personnel files are in a central location, and the search function makes it easy to find any file in the system. Compli eliminated inefficient internal processes and enabled us to focus on actual business matters.